Alpers, D. L., B. J. Van Vuuren, P. Arctander and T. J. Robinson. 2004. 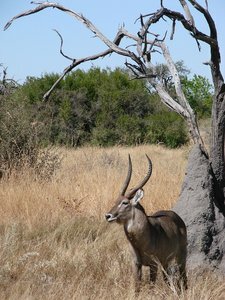 Population genetics of thse roan antelope (Hippotragus equinus) with suggestions for conservation. Molecular Ecology 13:1771–1784. Iyengar, A., F. M. Diniz, T. Gilbert, T. Woodfine, J. Knowles, and N. Maclean. 2006. Structure and evolution of the mitochondrial control region in oryx. Molecular Phylogenetics and Evolution 40(1):305-314. Gentry, A. W. 2000. Caprinae and Hippotragini (Bovidae, Mammalia) in the Upper Miocene. Pages 65-83 in Antelopes, Deer, and Relatives. E. S. Vrba and G. B. Schaller, eds. Yale University Press, New Haven. Klein, R.G. 1974. On the taxonomic status, distribution and ecology of the blue antelope, Hippotragus leucophaeus (Pallas, 1766). Annals of the South African Museum 65:99-143. Robinson, T. J., A. D. Bastos, K. M. Halanych, and B. Herzig. 1996. Mitochondrial DNA sequence relationships of the extinct blue antelope Hippotragus leucophaeus. Naturwissenschaften 83:178-182. The Extinct Blue Antelope. South African Museum. 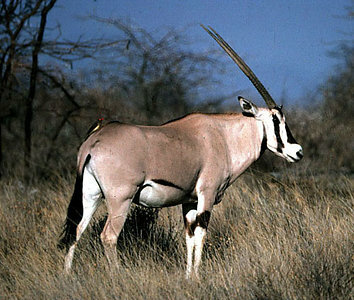 The oryx is well adapted to life in dry areas. It is light-colored to reflect radiant heat, it can sustain prolonged high body temperature, it browses mainly at night to maximise water intake and it seldom needs to drink. Long straight horns are present in both sexes and are used in defense against predators. The red-billed oxpecker bird on the oryx's rump is specialised for eating ectoparasites such as ticks. Page: Tree of Life Hippotraginae. The TEXT of this page is licensed under the Creative Commons Attribution-NonCommercial License - Version 3.0. Note that images and other media featured on this page are each governed by their own license, and they may or may not be available for reuse. Click on an image or a media link to access the media data window, which provides the relevant licensing information. For the general terms and conditions of ToL material reuse and redistribution, please see the Tree of Life Copyright Policies.